Nick Schroeder pitched a complete game with four strikeouts and no walks to lead the Falcons to a 3-1 victory. *Photo courtesy of @Saint Stephen’s Episcopal School. 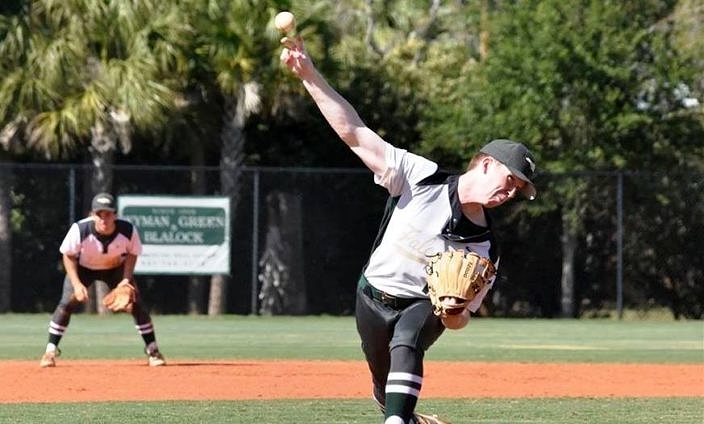 The St. Stephens Falcons extended their lead at the top of the district standings thanks to a pitching gem from Nick Schroeder, who tossed a complete game for a 3-1 victory over the Bradenton Christian Panthers. The Falcons (10-2) remain perfect in 3A-5 with an 8-0 district record, giving them a multiple-game lead at the front of the large pack of contenders. Schroeder was around the strike zone all day. The right-hander scattered five hits and did not walk anyone, while recording four strikeouts. Eli Thurmond accounted for the only run of the ball game for the Panthers (6-9, 2-5) with an RBI double that drove in AJ Schewe in the top of the sixth inning. St. Stephens grabbed the lead it never relinquished with its first swings in the bottom of the first inning. Ben Tobio got things started with a lead-off double to right field, and he quickly stole third base to get within ninety feet of scoring. A Devin Guzman ground out got the job done to get his team on the scoreboard. The Falcons added the deciding runs in the second. Wyatt Sevin lined a single to center and Schroeder reached on an error to get ducks on the pond. After Max Runde walked to load the bases, Tobio delivered again with a base hit to right field that drove in a pair of runners for a 3-0 advantage.